If I wasn’t doing this, I’d be a: national parks ranger. Most impressive person I’ve ever met: is Yo-Yo Ma. I unwind by: watching TV (I used to be a total TV junkie, but now I have a 2-year-old and no time!). Also camping or sitting on the back patio at the fire pit. On my desk right now is: a model toy school bus given to me by a mentor years ago when I graduated grad school. It is meant to serve as a reminder not to push the busses up hill, choose my battles, and only fight the battles you can win. It has served me well as a reminder. If I were on the other side of the stage, I’d: wish I could play the piano like Billy Joel. One trait an up-and-coming venue manager should have is: a thirst for knowledge, recognizing there is always more to learn. One of my goals for this year is to: make it through our building renovation with my sanity intact! How do you plan to help elevate the profession? I came across a meme on Facebook not long ago that was a quote from Kevin Spacey that said, “If you’ve done well in your career, it is your duty to send the elevator back down.” I don’t know if the quote is real or not, but I think that sentiment is something we all have to remember. Share our successes and failures, and let those coming behind us learn from them. Where do you see new growth opportunities in the profession? Integration between all of the various software we use. POS systems, venue management software, maintenance and work order systems, etc. So much potential for efficiency if all these systems talked to one another. Every company tries to do all of these things well themselves rather than partnering with the people who are already doing it well and creating integrations. Nobody can be good at everything. How do you stay current with industry trends and developments? Attending IAVM conferences, reading VenueNet regularly, asking questions when I have them, and establishing relationships with other venues in my region who don’t mind a visit from my staff now and again to pick their brains! Who are three people you’d invite to a dinner party and why? Jimmy Buffett, Kevin Spacey, and David Letterman. All brilliant entertainers I respect immensely and who have figured out something about life, priorities, and careers that I have yet to learn. Plus imagine how intelligent the conversation would be! Well, at least until the third round of margaritas. 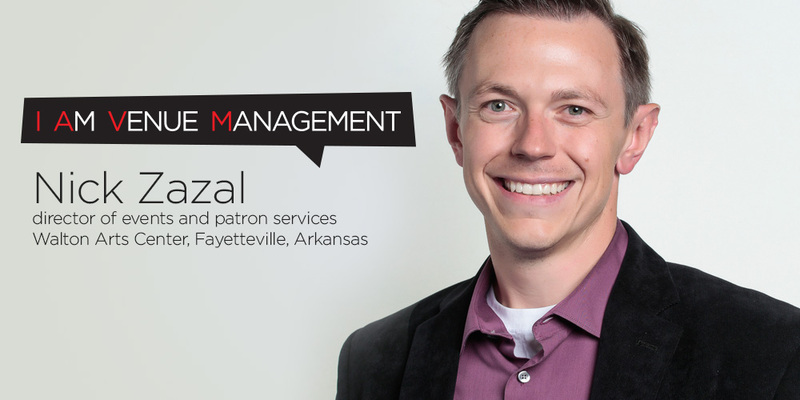 Nick Zazal is director of events and patron services at the Walton Arts Center in Fayetteville, Arkansas.